I just completed our very first wholesale order. Yahoo! 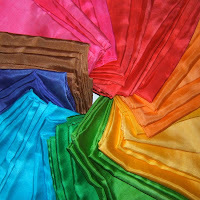 The order consists of 50 pieces of silk (35 x 35") hand dyed, one piece at a time, in 9 colours. 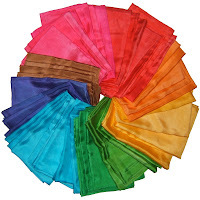 The silks will be sold as playsilks (click for more info about silkies~ scroll down) through a new Canadian online boutique specializing in natural and gentle items for children and families. Besides the blister on my palm from ironing, the toughest part of the order is seeing them sitting there all pressed and orderly and desperately wanting to toss them all around and play with them... I mean~ 50 silkies! I could decorate our front tree in the yard! As I finished up the last of the dyeing tonight, I had to giggle when Rowan was busily dyeing silkies in the other room. Shaking them out, and pressing them with her play iron and then bringing them in to show me as she informed me they were *not* for me, but were being mailed away, instead. I guess we all need a silkie break for a bit!